An award-winning memoirist’s moving account of how adopting a South Korean baby taught her about motherhood and love. Adoption had been an attractive option to Antonetta (A Mind Apart: Travels in a Neurodiverse World, 2005, etc.) and her husband even before they had begun trying to conceive. “Put together,” she writes, “we had a genetic picture that looked like a Munch painting: bipolar disorder and alcoholism going back many generations.” One painful miscarriage and several years later, the pair decided to adopt internationally and settled on Jin, an Asian boy with “dark hair and large liquid eyes.” Although not born of her body, the baby nevertheless had a profound impact on Antonetta even before she held him in her arms. Maternal hormones surged through her body, and in the months before Jin arrived, her home began to look like a cross between “late Victorian [and] early Fisher-Price.” Memories of her troubled past, which included drug abuse, a difficult relationship with her parents, and recurring battles with mental illness, also began to resurface. With both anxiety and joy, Antonetta plunged into motherhood knowing that it would remake her as a woman, wife and daughter. Though fear of rejection by Jin dogged her, she overcame it and learned to navigate the murky waters of transracial parent-child relationships in the process. 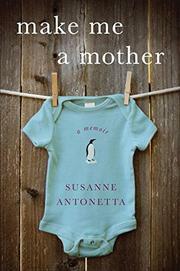 As she felt him “grow into [her], ounce by ounce,” Antonetta’s notion of family also evolved. Adoption did not simply occur between adults and children. It could also happen between adults and their parents, as when the author “adopted” her aging mother and father by becoming their caregiver. In the end, Jin’s otherness became the unlooked-for gift that taught Antonetta how love was as much about risk as it was acceptance.